The first book I read with Spanish 2 when I returned from maternity leave was Fiesta Fatal by Mira Canion. It was their first novel in the past tense, and they really enjoyed it. Even through the main characters are girls, my predominantly boy class liked the action and connection with the cartel. If you are going to teach it, make sure to get the awesome Teacher's Guide. La Quinceañera mini unit - We started this mini unit from Martina Bex right when I got back from maternity leave. We spent a couple days on it and went through the embedded readings, movie talking the videos in between each version. this really helped the student background knowledge on the celebration before starting the book. Morelia - Slideshow - We discussed the book setting using this slide show from Martina Bex. Mexico Mini Books - I wanted to have a chance to use these non-fiction readers about Mexico, and this seemed like the perfect time. In partners, students read and became experts on their chapter. We then read it together, stopping to have our experts teach us a little bit about their section. Even though they were basic readers, there was a lot of vocab that was out of bounds. In the future I would use these with a little more advanced students. I read the first chapter to the class, discussing as we went with projected questions from the Teacher's Guide. Character sort manipulative - I had these printed each on colored paper & cut apart in advance to reuse. Students reviewed the characters my matching the descriptions. Read and discuss article about Michoacán from Teacher's Guide. Used word cloud of chapter 3 from Teacher's Guide to predict what will happen next. Students had the choice to read alone or with partners. Reviewed Chapters 1-3 with the marker game - it was a hit with my competitive classes! We talked about public transportation in Morelia, using a reading and video from the Teacher's Guide. We reviewed the first half of the book with a Kahoot (Ch1-5) & Bingo from Martina Bex. I liked that in order to win Bingo, the students needed to describe the pictures they had marked in their own words in Spanish. Since we had been reading in the past tense, doing pop up grammar as we went with the new ending, they were ready to go a little more in depth. We used the 2 Past Tenses activity by Katherine Matheson to work on identifying and comparing preterit and imperfect at a very basic level. We discussed the border town of Cuidad Juarez using information from the Teacher's Guide. In pairs, students read chapter 6 in partners. Using an idea from the Teacher's Guide, they took turns reading two paragraphs, while their partner created a comprehension question about what they had just heard. They switched roles until they finished. It was a nice twist on having students read in groups. Students worked together to complete the fun Pictofrases activity by Cynthia Hitz. We discussed it as a class, focusing on the they form preterite endings. Since students had just read Esperanza, we compared the two different journeys across the border. Students wrote predictions about what Vanesa's life would be like at her new school. We read the chapter and used the higher order thinking questions from the Teacher's Guide to discuss as a class. I actually had a walk in administrator visit during this part of the lesson who told me he loved the (deskless) room set up and conversation! We discussed the city of Lafayette, Colorado, comparing it to where Vanesa lived in Mexico, and our own town in Iowa and then read the chapter. 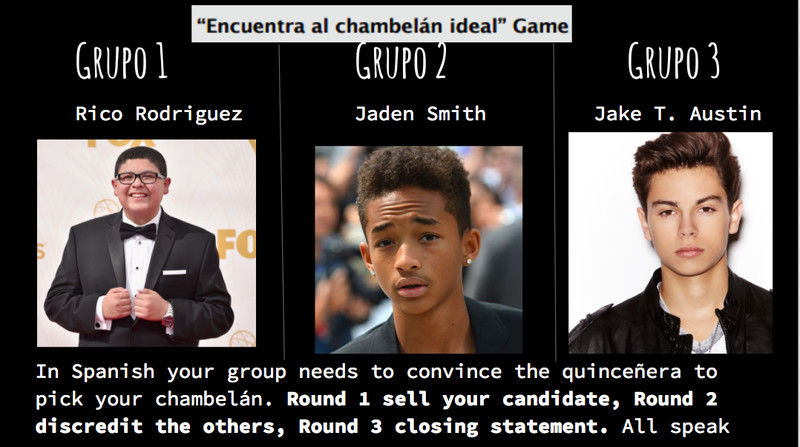 We played the "find the perfect chambelán" game from the Teacher's Guide. We picked our girl who would be looking for her quince date and had her face away from the board. The rest of the class was divided into three groups. 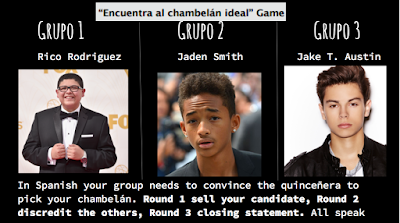 These groups had the task of trying to convince her in Spanish to pick their "date." I gave all groups a little time to prepare at the start and research their candidate on the Internet to help make their case. There were three rounds: sell your candidate, discredit the others, and closing statements. I kept their statements short and moving to keep high interest. In both classes, the girl picked the person she liked better, not necessarily the group who had the better argument. In the future I may need to have all equally "appealing" candidates to my target female audience. 4 drawing prediction from the Teacher's Guide. Read and discuss chapter using questions from the Teacher's Guide. Many students were so into it, they went home and finished the book to see what happened! you can not really be upset when students are reading in Spanish on their own. I dramatically read the last chapter to the class, so we would get to the dramatic surprises together. Story Retell by Cynthia Hitz using pre-cut cards. Quizlet Live - Glosario - I did not find this until the end of the book, but it would work well to play a little Quizlet live sprinkled through the book to work on the new vocabulary. Since the assessments for this book were our semester final, I wanted to make sure to include both interpersonal speaking and presentational writing. Interpersonal Speaking - In random pairs students asked each other about the book, comparing it to Esperanza and their own lives. Presentational Writing - Students completed their choice of writing prompts. Overall, my first time teaching this novel went great thanks to all of the wonderful resources shared by others and the guide. Here are other Resources I gathered before teaching it. 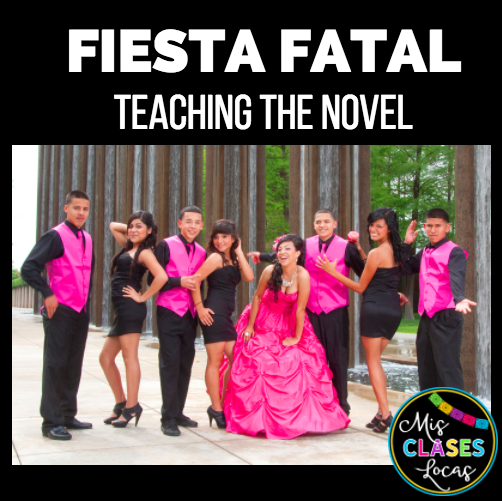 I would highly recommend Fiesta Fatal as a first past tense novel for late Spanish 1 or early Spanish 2. Have you taught it? Please share your resources below! About how many weeks did you spend on this novel? Do you read a chapter a day? I think it was about 4 weeks total for the unit. That includes some of the Quince Unit intro. For assessments there was another 3 days. We have about 50 min classes. We start with about 2 days for a chapter, but by the end just do a chapter per day. Hi Allison! Would you be willing to share what types of questions you used for assessments at the end? Interpersonal speaking and presentational writing? I am going to assess on the book, but have never tested with Fiesta Fatal - only done activities/questions from the TG. Any ideas you could share that have worked for you and would help me move in the right direction?